Your contribution matters! Peace Boat US is a 501(c)3-registered organization, so all donations are tax-deductable. In 2015, 193 UN member states came together to define 17 Sustainable Development Goals (SDGs) to shape the global agenda for sustainable development in the next fifteen years and beyond. Peace Boat US has made promoting and advancing the UN SDGs a key part of its mission, and believes that achieving the SDGs requires mobilization of young people through entrepreneurship, volunteering, research, education and other endeavors. 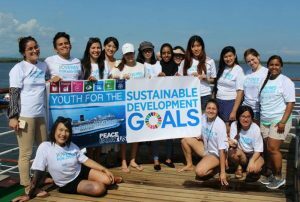 Toward this aim, Peace Boat US organizes the “Peace Education and the UN SDGs” experiential study programs onboard Peace Boat voyages, and supports participation by young activists though our “Youth for the SDGs” scholarships. MAPA, a project of Peace Boat US, brings established artists together with talented young artists onboard the Peace Boat, where they combine travel-based education and exchange programs with mentorship and guidance in undertaking multi-media projects about their experiences on land and at sea that include documentaries, concerts, music recording, photo exhibitions, and other forms of output. Peace Boat US welcomes donations via the link below, 100% of which goes toward the cost of participation (mainly travel logistics and onboard costs) for young talented artists. Please contact us if there is a specific project or campaign you would like to support!